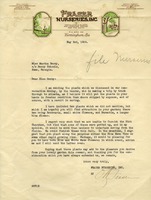 This letter is to Miss Martha Berry from O. W. Fraser of Fraser Nurseries, Inc. The letter indicates that the plants that were discussed in a conversation will be delivered by truck. The shipment will include two plants not mentioned: Broovaria and Durantia . Fraser regrets that he will not be able to furnish the Pink Cherokee at this time but will furnish them in the fall. Fraser recommends that in the meantime perhaps it might be pleasing to plant Blue Moon Vine or some rapid growing vine along the pergolas. If advised, both the Blue and White Moon flowers will be sent. Fraser is hopeful that the plants will provide Miss Berry with pleasure from her lovely garden.